10:43 | Lima, Oct. 24. 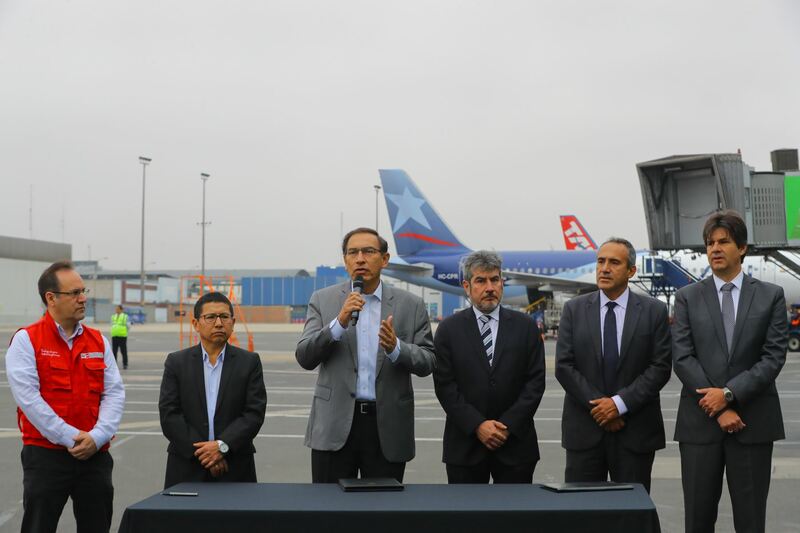 President Martin Vizcarra on Wednesday informed Lima's Jorge Chavez International Airport expansion investment will total US$1.2 billion in the next four years. The Head of State attended the ceremony marking the total land delivery to the airport's awardee Lima Airport Partners (LAP) for the construction of a new runway and a control tower. As is known, the license was granted in 2001, and the Peruvian State had promised to deliver the expansion lands in 2002. However, 18 years and four presidents had to take office for this agreement to be complied with. During that time, the airport went from receiving four million passengers to 23 million each year. Two operations also took place in order to expand the infrastructure and install 19 passenger boarding bridges, thanks to an investment worth US$350 million. "The circumstances require building a new airport at the same facilities. Operations cannot be carried out with just one runway," the statesman expressed. Apart from the US$1.2 billion commitment, the investment destined for its surroundings will amount to US$600 million aimed at the construction of hotels and convention centers. The top official went on to add he will talk with local authorities to facilitate the creation of an airport city in Lima. President Vizcarra was joined by Ministers Edmer Trujillo (Transport and Communications) and Rogers Valencia (Foreign Trade and Tourism Minister) on the occasion.